Directors at Commercial Estates Group (CEG) have said that Leicestershire has great potential for investors as the London market continues to heat up. Speaking at this month's MIPIM property conference in Cannes, investment director Andrew Woods said CEG already had a successful business park in Castle Donington and was embarking on £450 million plans to build 4,500 homes in Thurmaston, to the north-east of Leicester. Nationally, the company's portfolio covers nine million sq ft, with a capital value of around £800 million. Rental income is at £50 million. Mr Woods said there was no reason Leicestershire couldn't play a part in extending the London-based company's property holdings. He said: "For a London investor, what we already have in Leicester is quite significant and it's very much a city we believe has a very strong future and we want more opportunities there." Work on the huge housing scheme at Thurmaston could start next year, while tenants of the East Midlands Airport Industrial Estate include the PKF Cooper Parry accountancy firm. CEG development director Jonathan Kenny said they already had big plans to ensure the housing scheme north of Hamilton and east of Thurmaston would be a destination of choice for people looking for new-build houses. Mr Kenny said: "We have the housing development but also have a wider footprint across Leicestershire and the East Midlands. 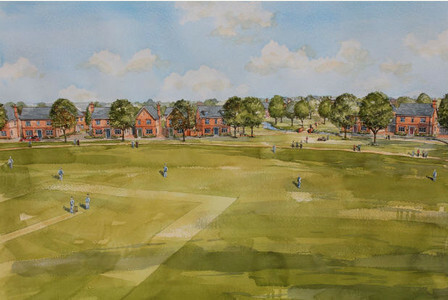 We want to create three villages in the new north-east Leicester development, maybe called something like Kingston Fields, Hamilton Fields or Barkby Fields, to break up the area. "There are 4,500 houses, but also the potential for three primary schools linked into secondary schools. "We are working with the landowner on a really high standard of architecture to make it the go-to place to live if you want to move into Leicester and want a new home. "Half of the development will be open space so it's a fantastic living environment with the right level of community facilities." He said they were expecting to gain detailed planning approval later this year or early next and building work on the first 600 houses could be under way in 2017. Mr Kenny said they bought East Midlands Airport Industrial Estate in 2012 for about £10 million as part of a wider portfolio purchase. He said: "We refurbished various buildings when we bought it and there was an office building previously let by BMI Baby which we relet to PKF Cooper Parry. "We did the fit-out and it's working really well for them. "That is a good example of why that location works because they are an East Midlands firm that has clients in the three cities around the airport." CEG also has two office buildings in the city, let to BT and De Montfort University. He said there had been a general lack of speculative office development in the city because rental levels were "not high enough" to justify it. But he said: "In the long-run, rates are going to have to go up and it will be better for banks to lend to speculative developers. "One thing that is needed is greater awareness of how easy it is to get to Leicester from London." Mr Woods said: "London is facing a housing crisis because of high costs and in the long-run people will decentralise staff. "The best thing Leicester can do is market itself – there are world class universities, a teaching hospital, the mainline railway and Britain's main motorway. "I would say keeping hold of graduates is the most important thing after infrastructure. "High class universities are an attraction to us. That is the hook – and with the M1 and rail links the rest will follow." He said another issue facing Leicestershire, and the region as a whole, was a lack of smaller trading estates to help the city and county's thriving family owned businesses grow. He said: "There is a lot of focus on inward investment, but there is a lot of demand for smaller industrial units below 100,000 sq ft for businesses such as manufacturers. "We think Thurmaston will be ideal for that – with about 1 million sq ft on 32 acres of employment space. "We will develop that ourselves and bring it to the market over one to five years. "I think it will go quicker than the housing because there is strong pent-up demand."